DeKalb Township is partnered with Cell Phones for Soldiers and is serving as a location for citizens to drop off their old cell phones to be recycled. Proceeds from the recycled cell phones will provide men and women overseas with prepaid calling cards. Cell Phones for Soldiers is a not for profit organization, who hopes to collect over 1 Million cell phones this year to help keep troops connected with their families. There will be no additional costs to the Township for providing the services associated with providing the new program. 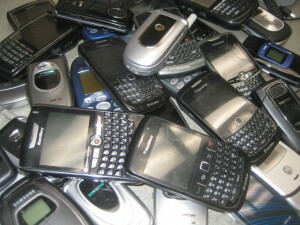 Cell Phones for Soldiers pay the shipping costs for the discarded cell to be sent to a recycling center. Cell Phones for Soldiers was founded by teenagers Robbie and Brittany Bergquist from Norwell, Massachusetts, with $21 of their own money. Since then, the registered 501(c)(3) non-profit organization has raised millions of dollars in donations and distributed millions of prepaid calling cards to soldiers serving overseas. Any make and model of cell phone can be recycled. However, cell phone accessories, such as cases, and hands free devices will not be accepted. Everyone is invited to recycle their old cell phones. Cell phones may be dropped of at the DeKalb Township offices located at 2323 S. Fourth Street, DeKalb Illinois Monday – Thursday 8:30 A.M. to 4:30 P.M. and Fridays 8:30 A.M. to 12:00 P.M.
With offices in the United States and Hong Kong, ReCellular Inc. is the world’s leading electronics sustainability firm. We provide solutions for the collection, reuse and recycling of used personal electronics that generate financial return for our partners, quality products for our customers, funding for charity organizations, and protection of the environment. Corporate and wholesale information is available at www.ReCellular.com. Charity fundraising and consumer information, including the Cell Phone Data Eraser® tool, is available at www.wirelessrecycling.com.